Green Criminology is a form of transgressive criminology. This means that it goes beyond the boundaries of traditional criminology. Whereas ‘traditional’ perspectives are anthropocentric (centred around human beings), Greenism is ecocentric (centred around the planet and its ecosystems). Within criminology, this means it takes a wider and more global view of crime. Traditional criminology focuses on crime as defined by the laws of a particular (human) society. Green criminology is focused on the concept of harm, which means that the wrongness of an act is assessed based on the potential damage it can do to the earth, its ecosystems and everything living within them, human or otherwise. Many such acts are not covered by traditional definitions of ‘crime’. For example, deforestation and species extinction are not necessarily defined as illegal within a particular society, often because it is the governments of these societies that are responsible for these things happening. But both acts have the potential to cause immeasurable damage to the planet and are therefore, from a Greenist perspective, ‘criminal’. Greenism also examines ‘secondary’ acts which can contribute indirectly to global harm. For example, governments that block or interfere with environmental groups (e.g. 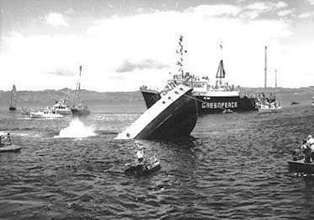 the French government’s sinking of a Greenpeace boat, or Donald Trump’s recent silencing of National Park workers) or the environmentally irresponsible actions of governments or corporations (e.g. the USA and UK cheaply disposing of its toxic waste and recycling by shipping it off to countries with non-existent safety standards). Despite its different approaches to criminology, Greenism does share some common ground with more traditional perspectives. For example, both Greenism and Marxism share a common ‘enemy’ – albeit for different reasons - in profit-driven government systems and corporations and both perspectives seek to highlight the ways in which these powerful groups define crime to serve their own purposes and seek to hold them to account for their immoral actions. Here's a sample answer based on the 40 Mark Question from this month's in-class progress test. Note that it's not essential or even important to get 'everything' we learned into the essay. You need to pick the right combination of studies, theories, concepts and ideas to structure an essay (and ensure there's enough of them - and that they're all well evaluated - to get the full 40 marks). From a Marxist perspective, crime is created by the structure and nature of capitalist societies. Capitalism creates crime through a variety of ways: By promoting and spreading values which result in criminality, by creating biased laws, by enforcing these laws selectively and finally by inciting rebellion among the working classes. These Marxist views were originally described by Willem Bonger in the early 1900s, but were revived and further developed in the 1970s and 1980s. Marxists believe that, in a capitalist society, the basic human values are capitalist values. This is because capitalist ideology is promoted and spread throughout the socialisation process in order to maintain the system. Althusser believed this happened through two sets of institutions: The Repressive State Apparatus (RSA), which included the police and government, forcing people to conform to capitalist views and the Ideological State Apparatus (ISA) which included the family, media, education and religion, subtly ‘brainwashing’ the population to accept capitalist values. These values include greed, selfishness, aggression, competitiveness and the importance of wealth, power and material things. Wealthy people expressing these values often become successful. For example, Donald Trump has a reputation for being aggressive and using bullying tactics, for exerting power over women and for bending the rules to further his own business and personal interests. This has enabled Trump to become seen as a successful businessman and, now, the President of the USA. However, a working-class person expressing exactly the same values is more likely to get into trouble (for example, a working-class man aggressively bullying someone or breaking the law to try and make money is likely to get the attention of the police). From a Marxist point of view then, the dominant values of capitalism create criminal tendencies in all social classes. However, Marxists note that wealthier people are much more likely to ‘get away with it’. Marxists demonstrate how the laws in capitalist societies are created by the bourgeoisie and they therefore ensure that these laws protect their own interests. Stephen Box demonstrated how the ruling classes socially construct the concept of crime in order that they are protected whilst the working classes are demonised. For example, Box showed how the concept of ‘murder’ has been used to define a very narrow range of acts (one person – usually a poor person – intentionally killing another). This particular act attracts the highest possible criminal sentence. However, other acts of ‘avoidable killing’ – for example, a factory owner killing dozens of employees due to not following health and safety regulations; a pharmaceutical company killing hundreds of people through marketing an untested drug – are not defined as murder and don’t tend to result in custodial sentences. Laws in capitalist societies are not only created and defined to suit the ruling classes but are also enforced in their favour. Karl Marx himself believed that a function of crime was to keep some of the proletariat off the streets and then create employment for others to guard them. This reinforces the Marxist view of the law being selectively enforced. For example, a person stealing money from till at work is a criminal and will be prosecuted; if that person’s boss reduced a worker’s wages in order to gain more profit for him/herself, it would be seen as normal practice in a capitalist society. Likewise, a person falsely claiming disability benefits, costing society a few thousand pounds, is likely to be demonised by the media and hounded by the authorities, probably going to prison. But when the British government cuts disability benefits dramatically, leading to a huge leap in poverty and suicide amongst disabled people across the country, this is praised as good economic sense. In general, Marxist’s observe that ‘street crime’ (mostly associated with the working classes) is the main focus of the police and regularly results in custodial sentences. White-collar crime, corporate crime and state-crime are rarely detected or pursued by the police and even more rarely result in custodial sentences. These types of crime are much more serious and damaging for society, but the public is ‘brainwashed’ by the ISA into ignoring or overlooking them. However, critics of Marxism suggest that this is an exaggeration as many acts committed exclusively by wealthier people (e.g. insider trading) have been criminalised. They also argue that the law cannot always be biased when many laws (e.g. health and safety legislation, minimum workers) were designed specifically to help and benefit workers (although Marxists like Chambliss believe that such laws tend to help and benefit employers and corporations just as much, if not more). Marxists believe that the ruling classes are always criminal because they pay workers less than they are worth, which is itself an act of theft. They also promote and sustain an unequal society within which they live lavish lifestyles while people around them are in poverty. Marxists believe that much working-class crime can be explained as acts of resistance and rebellion against this cruel system. The anger and status frustration felt by those at the bottom of society leads them to criminal behaviour as they fight back against the ruling classes. For example, Hebdige demonstrated how the skinhead subculture arose from the working-classes as an expression against them capitalist system that had destroyed their communities. Critics of Marxism point out, however, that most victims of working-class crime are other working-class people and that this explanation unrealistically romanticises deviants. In conclusion, the Marxist view offers a very clear picture of how a social system can influence the behaviour of its members and how one group in society can use crime and criminal law to exert power over another. Its explanations for crime are compelling and can be easily reinforced by the endless examples of corporations, bankers, governments and other ‘ruling’ institutions and individuals seemingly ‘getting away with it’. However, Marxism can be considered a reductionist view, because it ‘reduces’ the problem to a single cause (the capitalist system) and ignores most other variables (e.g. individual motivation/choice). A key flaw in placing all the blame on capitalism is that it can be easily observed that crime occurs in every type of society, not just capitalist societies. Additionally, many capitalist societies (e.g. Switzerland) have very low crime rates. The maltreatment and exploitation of workers (e.g. through poor working conditions) can be argued to be just as (if not even more) prevalent in communist societies. Therefore, Marxism may give insight into the origins and causes of some criminal behaviour in capitalist societies, but it cannot claim to explain all crime or criminal behaviour. It is therefore only one angle on crime, rather than the full picture. Read this in considering the rise in female crime. What does Archer believe are the main factors in the path these girls have taken? Status frustration? Gender-Role Socialisation? Pop Culture/Media? Key to the new A Level specification is Global Organised Crime. In this TED talk, Mischa Glenny discusses his research and work in this area. Essential viewing for new A2s. Official crime statistics present the view that working class people commit the majority of crime in the UK and this is a pattern repeated across all Western societies. As a result, a great deal of Sociological research into crime has attempted to explain why working-class people commit crime. This is particularly true of earlier studies from the Functionalist perspective, as Functionalists are uncritical of official statistics and use them as the basis for all their studies. For example, Merton’s Strain Theory explained crime as a result of the inability of working-class people to achieve cultural goals through legitimate means, while Cohen’s work on Status Frustration explained crime as a way in which working-class boys compensated for their low social status, having failed at school. However, the statistics – and the view they present – has been criticised. Much of the criticism has come from Marxists, who believe the official statistics are simply another method by which the working classes are demonised. From a Marxist point of view, it is in the interest of Capitalist societies to present the working classes as criminal in order to divert the attention of the public away from the much more serious injustices in society that are caused by the ruling classes. Marxists point out that the sort of categories used by the police to record crime (e.g. burglary, theft, violent crime) relate mainly to the sort of ‘street crime’ most associated with working class people, while crimes that are more associated with middle and upper classes (white collar crime; corporate crime etc.) are not recorded or dealt with by the police, therefore are omitted from official crime statistics. This criticism of the statistics reinforces and expands on other existing Marxist beliefs. For example, Marxists argue that the law is biased in favour of the rich; the ruling classes make the laws, therefore activities and behaviours of the working-classes are more likely to be defined as criminal, particularly when those activities threaten the capitalist system (for example, the criminalisation of picketing following the Miners’ Strikes of the 1980s). Marxists believe that the bourgeoisie are the real criminals, as their activities and behaviours are much more damaging for society, yet these things are never defined as criminal and the public is conditioned not to think of them as such. Further to this, Marxists believe that the law is selectively enforced, meaning that even when the upper classes do break the law, they are less likely to be prosecuted. For example, a wealthy person who evades millions of pounds of tax is less likely to be prosecuted than a working-class person who falsely claims a few thousand pounds in benefits. Marxists do accept that working class people do commit crimes, but many argue that this tends to be out of resistance or rebellion. For example, Hebdige argued that the criminal and violent behaviour of the skinheads was a reaction to the destruction of working class communities by profit-driven developers. Critics argue that these sort of views attempt to justify or romanticise some criminal behaviour and also fail to recognise that the victims of most working-class crime are other working-class people. Marxist views are criticised for being reductionist (every problem has the same source: Capitalism) and it is pointed out that it is not only the activities of poorer people that are criminalised: Many capitalist activities (e.g. insider trading) have also been made illegal, while there are plenty of laws which benefit poorer people in society – for example, welfare laws. Right Realist Charles Murray also made a link between crime and social class, though Murray’s views are in direct contrast to Marxist views. Murray believed that most crime originated in the underclass. For Murray, the underclass was a product of the welfare state: A section of society who had been made lazy and dependant by governments offering them money and support for doing nothing. Murray considered the underclass almost as a subculture, with different norms and values to the rest of society. From Murray’s point of view, these values tended to be negative (e.g. bad parenting, lack of family values), and led people towards crime and deviance. Murray’s views can be criticised for making generalisations about groups in society, particularly in assuming that poorer people have different values to wealthier people. Interactionists like Becker have argued that those from lower class backgrounds are more likely to be labelled as criminal than those from wealthier backgrounds, as they have less power and influence in order to resist such labels. Studies on Moral Panics support this, as most Moral Panics around crime and deviance focus on groups associated with the working classes (e.g. mods and rockers, football hooligans, trade unions, hoodies) – also these sorts of labelling theories and studies have been accused of hand-picking examples that support their theories, particularly more exotic subcultures. In conclusion, it is difficult to establish a concrete relationship between crime and social class. Much work and theory has been done on the crimes of lower classes and the statistics present a clear view that working class people are more criminal, but such statistics are social constructions; they only show crimes reported to and recorded by the police and are therefore to be treated with caution. The crimes of wealthier people are hidden by the statistics and therefore impossible to accurately measure, assess and compare. The true relationship between social class and crime may therefore never be known. American sociologist Charles Murray was the first to develop – and put into contemporary usage – the concept of an underclass. He applied the concept to Britain during a visit in 1989. "When I use the term 'underclass' I am indeed focusing on a certain type of poor person defined not by his condition, e.g. long term unemployed, but by his deplorable behaviour in response to that condition, e.g. unwilling to take jobs that are unavailable to him." Murray viewed the underclass as a kind of deviant subculture, with different values to the rest of society. He believed that crime –and the rising crime rate - was a direct result of the negative values of this subculture. Bad parenting and illegitimacy were the main causes of crime, in Murray’s view. In 1979, Britain had an illegitimacy rate of 10.6% but by 1988 this had risen to 25.6%. Illegitimate children are more common among the underclass and tend to "run wild" because they lack father role-models. The rise in illegitimacy is due to the benefits system in Britain. Changes in welfare provision make single mothers a priority for housing and receipt of benefits, therefore removing the stigma and disincentives for pursuing single motherhood. Children of fatherless families tend to lack discipline both in and out of the home. The rise of such families negatively impacts on family values throughout the whole of society. The benefits system also has the effect of making young men not want to work, creates laziness, dependency on the State, saps moral fibre and erodes Christian ethics. This leads them towards crime, ensures the continuation of the underclass and, ultimately, causes the breakdown of communities. HIGHLIGHT OR UNDERLINE THE EXPLANATIONS MURRAY GIVES FOR CRIME. WHAT IS MEANT BY THE ‘ILLEGITIMACY RATE’, HOW MUCH HAS IT INCREASED AND OVER HOW MANY YEARS? WHY DOES MURRAY THINK THE BENEFITS SYSTEM/WELFARE STATE MAKES PEOPLE DEPENDENT AND LAZY AND DAMAGES THEIR MORAL FIBRE? Official crime statistics consistently show that a disproportionate amount of crime is committed by young people. The peak age of offending is 17 for males and slightly younger for females (although the crime statistics also show that males commit the overwhelming majority of crimes). Sociologists argue that official statistics are flawed, as they can be manipulated according to the prejudices and priorities of police officers, do not account for all types of crime and are reliant on public reporting offences to the police. This might mean that the criminal activities of young people are misrepresented by statistics. Police officers and forces may stereotype and target young people as being more likely offenders, making them more likely to be stopped, searched or arrested. Additionally, offences such as white-collar crime and corporate crime are not included in official statistics, and these are crimes that young people are unlikely to be involved in. Even if the statistics do exaggerate the problem, however, the crime rate among younger people remains sufficiently high that Sociologists have sought to offer explanations for it. Subcultural theorists focus on the criminal activities of young people. For example, Cohen believed that young, working class boys experienced status frustration as a result of failure within the school system. This led them to form deviant subcultures which inverted middle-class values, enabling the boys to gain status through deviant behaviour (for example, disrupting lessons in school earned them respect from others in the group – as did criminals acts and anti-social behaviour outside of school). However, Cohen is criticised for focusing only on males. He also cannot prove that a person’s sense of failure happens at school and, in any case, his theory cannot explain all crime (for example, why might a middle class boy turn to deviant behaviour?). Matza also studied the criminal and deviant behaviour of young people but rejects these kind of subcultural theories. He believes that all young people may be equally likely to be deviant or criminal, but believes this is a ‘normal’ part of being young. He argued that youth is a difficult time, as it is a transitional period and young people often feel like they have no control in their lives. He suggested that some criminal or deviant behaviour was an attempt by young people to regain a sense of control. Further to this, Matza believed that every person possesses ‘subterrenean values’ (socially unacceptable values), which we learn to manage and repress as we get older. Young people are still learning to manage these values, and so, inevitably, during them time they may occasionally fail to manage them, and commit an act of crime or deviance. Matza used the term ‘drift’ to describe the criminal/deviant behaviour of young people: They ‘drift’ in and out of crime and deviance when young, but once they achieve adulthood and have their subterranean values in check, this stops. However, Matza has been criticised for being rather vague in some of his ideas; he never clearly explained what sort of things constituted ‘subterrenean values’ and the idea that committing deviant acts helps someone gain control in their lives is questionable – many argue it achieves the opposite. Interactionists argue that young people are more susceptible to being labelled as criminals or deviant and they have less power to reject or ignore such labels. Interactionist studies have often focused on such labelling of young people and its effects, for example Jock Young observed how the labelling of marijuana users by the public and police made them outsiders and actually caused an amplification of their deviant behaviour (as many turned to harder drugs, or to dealing drugs). Stan Cohen’s study of the moral panic surrounding the mods and rockers subcultures demonstrated how the media played upon social concerns about young people, resulting in the demonization of these two groups. The unintended consequence of such a moral panic was, again, an amplification of deviance, as the exaggerated media reports attracted young people to the subcultures and created expectations of their behaviour. However, these sorts of labelling approaches cannot explain primary deviance (the origins of deviant behaviour) – they only explain how social reaction can lead to futher (secondary) deviance. Marxist subcultural theories have suggested that youth crime and deviance is linked to social class; young people form spectacular subcultures as a method of rebelling against the capitalist system. For example, Hebdige showed how the skinhead movement arose from London’s East End in response to the culture of the area being destroyed by wealthy developers. The style of the skinheads showed their resistance, through exaggeration of traditional working class styles (e.g. workbooks, denim, shaved heads). In conclusion, even if the statistics do exaggerate the youth crime rate, many sociologists believe that it is a problem and seek to explain it. Many of these explanations however, suggest that criminal behaviour as a young person does not guarantee the person will be criminal when older. Youth subcultures don’t tend to be carried over into adulthood and, as Matza suggested, values change and develop as people getting older, leaving less socially acceptable values behind. Hirschi’s ‘Bonds of Attachment’ theory concurs with this: Hirschi argues that feeling strongly connected to society through a series of bonds (e.g. involvement in society; personal commitments) reduces a person’s likelihood of being criminal. Young people would typically have weaker bonds (e.g. no work or family commitments; lots of free time due to little involvement in other activities) so may be more likely to be criminal – but the bonds grow stronger as they get older, so criminal and deviant behaviour disappears.